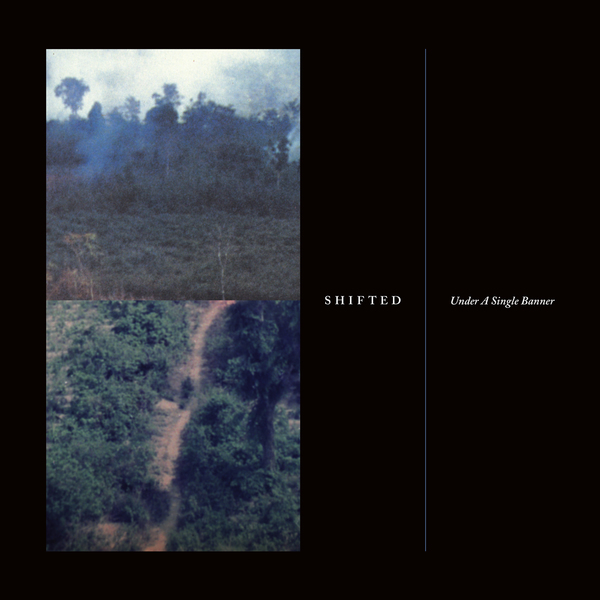 Having just recently been unmasked as the producer behind Blackest Ever Black's excellent Alexander Lewis album, Shifted follows up last years ‘Crossed Paths’ LP for Mote-Evolver, as well as releases under the Covered in Sand and Pacific Blue aliases with this strong debut album for Hospital Productions offshoot Bed of Nails. 'Under A Single Banner' consolidates the ductile reference points of his nebulous aliases, from cranky, club-crunching gear to noisier experiments, making for the bleakest definition of his sound to date. It's an uncannily tight fit with the Bed of Nails' aesthetic alongside Dominick Fernow's Rainforest Spiritual Enslavement and Vatican Shadow productions or Kris Lapke's Bronze Age, taking refuge in a no-mans-land of barbed rhythms and claggy ambient sound design at the nether region of noise and techno. Its nine tracks are split squarely between powerful club potential and immersive introspection: DJ/dancers should be clambering for the unrepentant pummel of 'Pulse Incomplete' or the body-rolling torque of 'Burning Tyres' and jaw-wrenching closer, 'Wash Over Me', but equally, classic industrial fiends will appreciate the fine balance of empathic ambient and and textural sophistication that makes the title track and the rhythmic noise of 'Chrome, Canopy & Bursting Heart' so affective. If you're into Sandwell District, Marcel Dettman, Blackest Ever Black or Regis - we urge you to check it out.